GetHiking! About the beginning, the founder - GetGoing NC! GetHiking! is the first active program launched by GetGoingNC LLC. Begun as a health and fitness blog in 2009 by Joe Miller (looking very short, but actually kneeling, above) with the support of Blue Cross Blue Shield of North Carolina, the GetHiking! Program is an outgrowth of Joe’s 20 years of writing about active living coupled with his experience as a hiking coach for CureSearch for Children’s Cancer’s Ultimate Hike program. Hiking, GetHiking!, 2013 to present. Founder of the statewide GetHiking! program, which currently has more than 3,000 members in the Triangle, Triad, Charlotte and Greenville. Promotes hiking through beginner-friendly hikes and hikes that challenge more experienced hikers. Program also includes the monthly GetHiking! 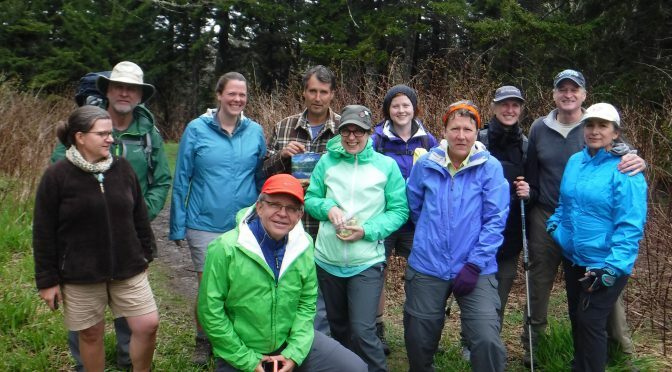 Southeast’s Classic Hikes program and GetBackpacking!, a four-week intro to backpacking class. Ultimate Hike, 2011 to 2014. Was responsible for training and conditioning hikers to cover 28.1 miles of mountain terrain in one day as part of a fundraising program for CureSearch for Children’s Cancer. Mentor, Fit-tastic 0 to 5K program, Capital RunWalk, 2011. Joe assisted with this 12-week program that trains non-runners to run a 5K. Certifications: Wilderness First Aid, SOLO, 2014; CPR-AED, American Safety Health Institute, 2014. Author, 1998 to present. Joe has written three books on hiking/backpacking: “Take It Outside: A Guide to Hiking in the Triangle” (The News & Observer, 1998); “100 Classic Hikes in North Carolina” (The Mountaineers press, 2007); and “Backpacking North Carolina” (UNC Press, 2011), and “Adventure Carolinas,” a guide to adventure sports in North and South Carolina (UNC Press, 2014). Writes about adventure for VisitNC.com, the state tourism web site. He is working on a book about exploring North Carolina’s land trust properties. Outdoor Adventure Columnist, The News & Observer, July 1995-December 2006. Joe wrote Take It Outside, a weekly outdoor adventure column appearing in the paper’s Friday weekend entertainment section and Sunday Travel section. The column covered a range of pursuits, from hiking, backpacking and trail running to cycling, paddling and scuba diving. GetGoingNC.com, owner and sole content provider, 2009-present. GetGoingNC.com is a health and fitness blog sponsored by Blue Cross of North Carolina. Its goal is to inform North Carolinians about the benefits of active living and help them find the activity that’s right for them. Health and Fitness Writer, The News & Observer, January 2006-March 2009. Joe wrote about health and fitness issues, primarily for the paper’s daily features section.